For this year's roundup of Holiday Gift Books I'm highlighting 36 books by the same number of publishers, arranged alphabetically by publisher – from Actar to Yale. Titles link to IndieBound and covers link to Amazon for easy gift-buying. A slim, 92-page book that sees Siza, with Kenneth Frampton, revisiting the great pool he designed more than 50 years ago in Leça de Palmeira, Portugal. A really nice monograph on OPEN, the firm led by Li Hu and Huang Wenjing that recently completed the UCCA Dune Art Museum. One of these days I'll make it south of the border to see the great architecture in Mexico City. When I do, I'll have this excellent guide to steer me around. A reprint of the first three "Complete Works" on the influential Swiss architects. Per the publisher's website, the set is in German/English, not just German as in the links above. I'm excited to get my hands on this large-format book that catalogs Archigram's activities in the 1960s and 70s and includes 165 pages from the ten Archigram magazines. An artistic, and visually dense and layered take on the architectural monograph, Edge of Center runs through Libeskind's life and important projects. Told in first person through collaborator Tim McKeough. This petit book transcribes a lecture given by Mexican architect Tatiana Bilbao at Columbia GSAPP in October 2016. With a focus on housing, Bilbao makes many logical arguments for improving housing for all. Neutelings Riedijk's buildings and projects are presented in twelve thematic chapters (seam, pattern, cutout, etc.) that focus on expression and identity in a globalized world. Closer in size and proportion to a guidebook than a traditional monograph, HWKN's first monograph mixes their words and renderings with professional photos and images from social media. I learned about Mikael Colville-Andersen many years ago through Flickr, where he has thousands of photos of people on bikes, both in his native Copenhagen and in many other cities and countries. This book collects his thoughts on bicycles and their place in cities. Architect Yuichiro Edagawa explores the roots of Japanese creativity in architecture, focusing on the role of details in whole buildings. Analyses of self-sustaining physical environments such as Biosphere and Masdar City accompanied by stunning "feedback drawings." Easily one of the best books I read this year: my review. 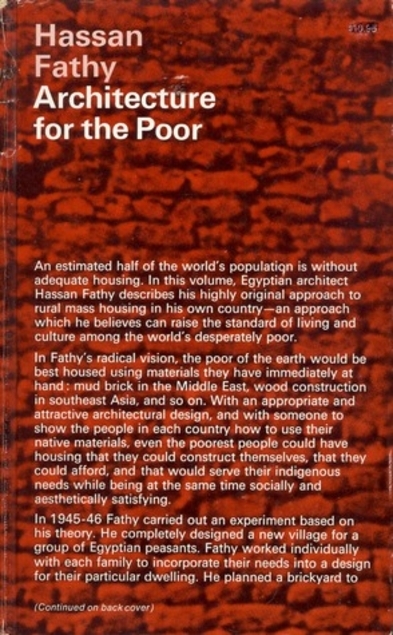 Hassan Fathy's Architecture for the Poor is a classic and a must for any architect (I'm grateful to have gotten my hands on a first edition at a used bookstore a few years ago). Earth & Utopia is a beautiful tribute to Fathy's words and buildings, presented as a large-format book with plenty to absorb on every page. Documentation and comparisons of starchitect-designed museums in China and the Arabian peninsula as well as such nearby places as Azerbaijan and India. A "provocative history and deconstruction" of that appendage to the American house that's supposed to shelter cars but is often used for other things; a collaborative creation by an artist (Erlanger) and an architect (Ortega Govela). A great combination: Around 60 buildings designed by Le Corbusier, photographs by Richard Pare, and words by Jean-Louis Cohen. It's Pare's photos that stand out, drawing attention to the varied states of Corbusier's buildings. Philip Johnson's great sculpture garden at MoMA turned 75 this year. This coffee table book celebrates the "oasis" in Midtown Manhattan, just as MoMA transforms itself through another architectural expansion. Rebuild by Design is an innovative process for creating resilient cities and coastlines, born from Hurricane Sandy in 2012. This book documents the process and the various designs in the works around the USA. The latest collection of architecture critic Martin Filler's "reassessments" of significant modern architects — all originally published in NYRB — spans from Frederick Law Olmsted to Maya Lin, with roughly 20 more architects in between. I've been a fan of the built and unbuilt "unprecedented realism" (the name of their 1996 monograph) of Rodolfo Machado and Jorge Silvetti since at least the mid-1990s. This monograph collects projects designed by the duo over the last four decades. The official publication of the Swiss Pavilion at the 2018 Venice Architecture Biennale, winner of the Golden Lion for best National Participation. The labyrinth of empty apartments at various scales drew attention to the literal emptiness of photos of residential architecture in Switzerland. Although Phaidon's one-page-per (building, garden, etc.) format is a bit formulaic and inherently shallow, sometimes the subject makes one of these titles irresistible. For me, it's architectural drawings by Zaha Hadid, Roberto Burle Marx, and many more. French-Polish photographer Nicolas Grospierre captures the interiors of buildings "both grand and mundane," most I was completely unaware of. The photos are presented as pairs with similar spaces and characteristics but divergent uses and geographies. The sequel to Rick Joy's Desert Works presents 13 projects completed by the architect in the last 15 years, many outside his home state of Arizona. Beautiful photographs make this monograph, just like his first one, a must. Sub-subtitled "Luminist Architecture," this handsome, slipcased book documents seven Steven Holl houses completed over the last twenty years, some of them on the architect's own property north of New York City. An academic title on phenomenology that argues for the importance of place in our "mobile, hypermodern world." David Seamon was a professor of mine in undergraduate architecture school at K-State, so I'm looking forward to diving into his latest book. Koolhaas updates his 2014 Venice Architecture Biennale exhibition as a 2,528-page behemoth designed by Irma Boom. I've heard of exhibitions on the models that Santiago Calatrava has produced over the years, but lost in the shuffle are his sketches, collected and discussed here relative to his bridges, train stations, and other structures. The first monograph of Gustafson Guthrie Nichol, it contains such landscapes as the Bill & Melinda Gates Foundation Campus in Seattle, the National Museum of African American History and Culture in DC, and the Lurie Garden at Chicago's Millennium Park. Sophia Psarra paints a portrait of Venice as a prototypical city aided by analyses of Italo Calvino's classic Invisible Cities and Le Corbusier's project for Venice Hospital. The fifth installment in TCLF's "Pioneers of American Landscape Design" project chronicles the lives and work of important landscape designers in an encyclopedia format. Necessary for landscape designers and those interested in the preservation of modern landscapes. Jordan H. Carver, a contributing editor to the Avery Review, has investigated the architectural spaces of secret prisons and taken a look into the post-9/11 spaces via architectural drawings. The third edition of Historic Preservation comes a couple years after the National Preservation Act of 1966 turned 50. One could argue preservation is even more important now, making this a much-needed introduction to the subject. The authors of City Unseen reveal that the satellite views of Google Earth aren't the only way to see the earth from above. They present traditional satellite views with non-visible wavelengths colored to convey more information about cities and landscapes.